Potato types, the ones on the left are some of the types grown in the Andes for 100’s of years and modern more uniform cultivars. Today the potato (often spelled potatoe in the past) is the most used vegetable in the United States and is ranked at present as the 4th most important food crop in the world. Its importance as a world wide food crop does not have a long history, the potato was firsts grown as a food crop 7,000 to 10,000 years ago in the highlands of southern Peru and northern Bolivia where it grew well in the colder, moister climate of that region. It was discovered by the Spanish and taken to Europe in the second half of the 16th Century where it in most places it stayed a minor crop, till into the 17th Century. The first country in Europe to widely use potatoes was of Spain which first brought them back from South America; it became popular as a food for the Spanish Armies and with fisherman who took it to sea as supplies by the middle of the 16th century. The potato had reached most of Europe by the beginning of the 18th century although it did not become instantly popular due to resistance to new crops one which was it was not mentioned in the Bible. Another stumbling block was because the situation where most farmers were tenants farming on shares, they were expected to plant grain which had a ready market due to shortages and the practice of the day was to leave ½ the fields fallow every year to allow the soil to build back up. Two situations helped popularize the potato as a food crop in Europe; the first was a colder, wetter time period often called the Little Ice Age that lasted about 500 years from around 1350 to around 1850, this gave good conditions for it to grow in much of northern Europe which caused the problem of raising enough grain crops to feed people. The other situation has already been mentioned, the common grain crops of that era and area such as oats, barley, rye and wheat required that the land be planted in that crop every other year, leaving ½ the fields to lie fallow every year. It was found that potatoes could be grown in these fields formally left fallow there by increasing the food supply by more than double because the potato has a greater food value per acre than the grain crops commonly grown in that era. Because of this increasing of food production by the start of the Industrial Age in the late 18th century potatoes was the second most important food crop after the grains in the northern part of Europe, including the British Isles. The ability to double the production on the available land help contribute to the Industrial Revolution allowing both a population growth, creating surplus workers who could move into cities as well as a way to feed them. The small spaces for required to grow this crop allowed city dwellers lucky enough to have a small amount of land could grow at least a portion of their own food, a spade (to turn the soil and dig the crop) and a hoe (to cultivate) being all the equipment required. Also the potato is ready to eat as dug from the ground, requiring none of the threshing, winnowing, grinding and sifting the grain crops needed to be turned into food. The potato was introduce into Russia in the late 18th century a country that lacked the massive industrialization and more tillable land than other parts of Europe, helped the traditional grain crops and feed the people of Russia. Russia had a lot less industrialization than many of the other countries in Europe, meaning the mass movement to the cities to work in the factories was much smaller than Germany and England. It remain a minor crop in small plots till grain crop failures in 1838-1839 forced the country to grow potatoes in a more massive scale in the fallow grain crop land to help feed the peasants of that country. Other countries in Europe grew potatoes as food, the total dependence varied with the county. The potato was brought to the English colonies in North America with the early English settlers where it became a popular crop and moved west as settlers moved west. The other parts of the world adapted or would adapt the potato in the future and inexpensive food that was easy to grow. With all the extra land the Americans did not become as dependant on it as many places in Europe did. So within 100 years give or take, the potato went from a seldom seen novelty food to a food much of Europe and even America had come to depend on, one problem at the time with potatoes being a important staple was that despite the Incas using a crude freeze drying method, the crop had a very limited shelf life and there was no real practical way to preserve them beyond keeping them a few months in a cellar or some other similar storage area. Unlike grain which will keep in the whole state for several years with dry, ventilated storage, potatoes were hard to build a stock of for bad times like grain was, any excess could only be left to spoil or fed to livestock, this situation was to lead to a major disaster. The disease seems to have shown up in the United States by 1842, the British Isles and much of the rest of northern Europe in the middle by 1844, the United States was not severely affected due a much lesser percent of crops grown for food being the potato and the crop fields being often much further distance apart. 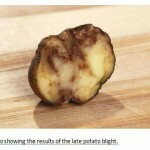 The disease popped up during a time of below normal temperatures and above average rain, allowing the disease to have more ideal climate in which to spread along with the larger percent of fields growing potatoes in this area of the world. In Northern Europe it caused major famine and it hit parts of Scotland hard, but the hardest hit area was Ireland where almost half of the poor were almost entirely dependant on the potato, and the majority of the potatoes grown were of one cultivar, known as the Irish Lumper, this potato was well suited to a style of agriculture often used in the area called lazy beds, where the crop is raised in a raise bed with a lower furrow to allow drainage, the potato crop was most often grown in the same field year to year letting the disease find a host in the same plot year after year. Between this and the lack of resistance to the disease by the Irish Lumper, the almost total loss of the potato crop in Ireland between 1845 and 1852 caused and estimate 1,000,000 deaths and another 1,000,000 to emigrate elsewhere, a majority of these came to the United States, many settling in the cites. 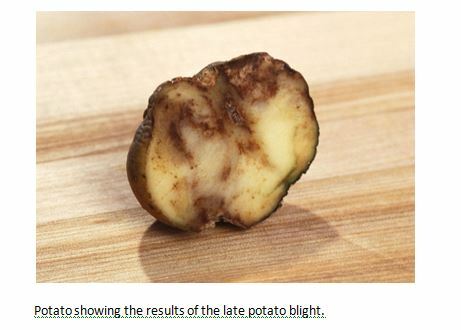 The lack of resistance in this strain of potato was increased by the way potatoes are grown, since potatoes are grown from the tubular being cut into pieces with at least two of the so called eyes, (one for the roots and one for the stem, leaves and flowers) each potato is a clone, with no genetic differences at all between the individual plants, this allows a disease like the potato blight to run rampant and totally devastate a crop. The other way the blight was brought under control was chemically, specifically with a mixture of Copper(II) sulfate (CuSO4) and slaked lime (Ca(OH)2 often called Bordeaux mixture because it was developed in that region of France in the 1880’s for use on an unrelated fungus disease of grape vines, it was found to also work on the late potato blight. As an interesting side note, during WWI there was a major copper shortage in Germany due to its use in ammunition (Germany does not have many copper deposits) this lack of copper led to shortages of Copper(II) sulfate this and a cold wet season in 1916 led to both grain crops failing and ideal condition for late potato blight, an Allied blockade prevented food from being shipped in leading to food shortages, also much of the available food was shipped to the military. This lead to the deaths of what was said to be 700,000 German civilians due to starvation and also disease caused by poor nutrition, potatoes being a large part of the diet for many Germans. This lead to fairly wide spread looting by people searching for food and the substitution of turnips to replace the missing potatoes gave the winter 0f 1917-1918 the name of the turnip winter with many Germans. 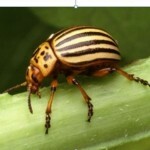 Another major pest of the potato plant is a the beetle Leptinotarsa decemlineata, commonly know as the Colorado Potato Beetle or among other names, simply Potato Beetle, Potato Bug or Tator Bug although this insect is a true beetle and not a true bug. 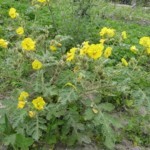 It feeds one the leaves of the host plant and a large infestation can strip the leaves completely killing the plant. This beetle has its origins in the foothills of the eastern side of the Rocky Mountains and originally fed on another plant in the same family known by the common name Buffalo Bur (Solanum rostratum) but quickly adapted to the potato as well as other crops in the same family the egg plant and the tomato, although it will eat the leaves on either of the plants it prefers the potato over the other two as well as its original host plant which native range is through out the Great Plains from Mexico to Canada. 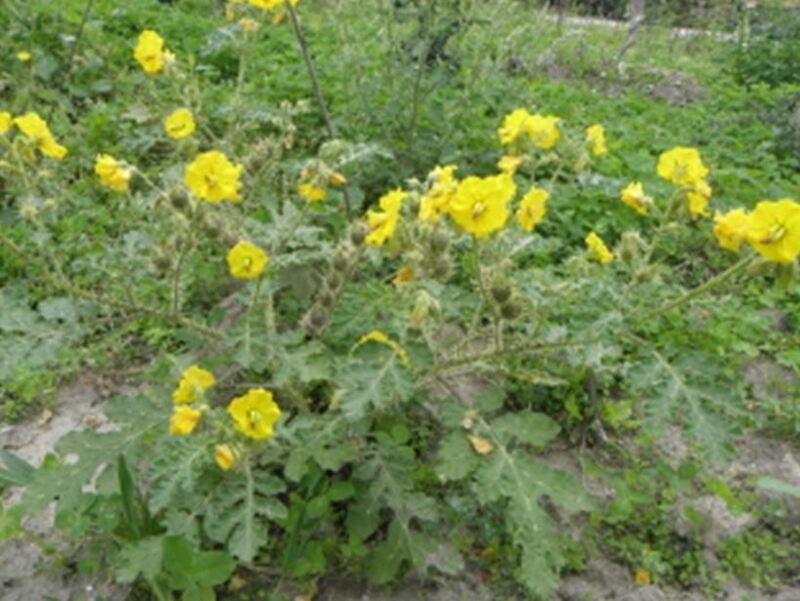 It is what is often called a pioneering plant, that is a plant that is one of the first to grow in disturbed area and is important to the environment because it helps protect the soil from erosion only becoming a pest on a large scale when grasslands are over grazed and its thorns which are mildly poisonous are the main problem with the plant, in the fall after it dies out it become a type of tumble weed, distributing its seed as it travels and the seed can remain in the ground for years till suitable condition are met by lack of other cover plants. 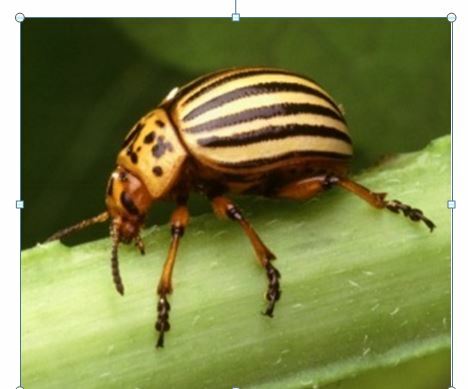 As to whom the person of European first discovered the Potato Beetle is not known but was first described and given its taxonomical name by Thomas Say, an American naturalist in 1824. Its native range is also not totally understood it may be as some state, native to the more western range of the Buffalo burr or it may be native through out its range. It is known to have been found on cultivated potato crops by the 1840’s and was know to have spread as far east on potatoes as eastern Nebraska by the 1850’s. Upon crossing the Missouri River, it rapidly spread through out the eastern United States and was found in Germany by 1877 where it spread into the rest of Europe making it a major pest on potato crops through out the area and has spread into Asia. This insect also is very good at becoming resistant to modern pesticides, this can make it difficult to control, also and insecticides need applied at the right time, types used needs to be rotated as well as rotating crops helps control it. Also a small infestation will not harm crops greatly if the amount of these pests reduces the leaves of the crop less than half. In smaller plots the best control is to walk the patch every couple of days removing and killing the easy to spot insect by hand. Potato growing although as mentioned earlier can be done with a minimum of equipment, on a large scale there is more work involved with out mechanical advantage, this is because of the underground tubers, they need planted several inches deep and are of a large size compared to most true seeds, then when the crop is ready the potatoes have to also be dug, many root crops such as turnips and beets can be harvested by simply grasping the stems and pulling them out of the ground, potatoes are harvested after the vine has died down and few if any of the potatoes will come up when the vine is pulled out of the ground. The horse drawn mechanical potato planter was developed in the 1870’s and the mechanical potato digger was developed in the 1880’s, this reduced the labor to grow this crop although the harvester only removed them from the soil and they still had to be gathered off the ground by hand. Mechanical seeders were developed in the pre-Civil War era and allowed one person and one or two horses to plant far more crops in a day than by hand. In good loose soil most of the other root crops are easy to harvest by simply pulling them out of the ground, if not spading along the row or plowing along the row will make them easy to harvest by hand. The mechanical potato planter was developed in the late 1870’s and the mechanical potato harvester was developed in the middle 1880’s, these inventions made commercial growing of potatoes on a much larger scale possible. The harvester dropped them on the ground so they still had to be picked up by hand, but for anyone who has ever gardened and dug potatoes by hand will understand the labor saving this device allowed, it also could be used for other root crops, saving labor on those as well. Drawings of early potato planter and harvester and photo of harvester in use showing the potatoes ready to be picked up. 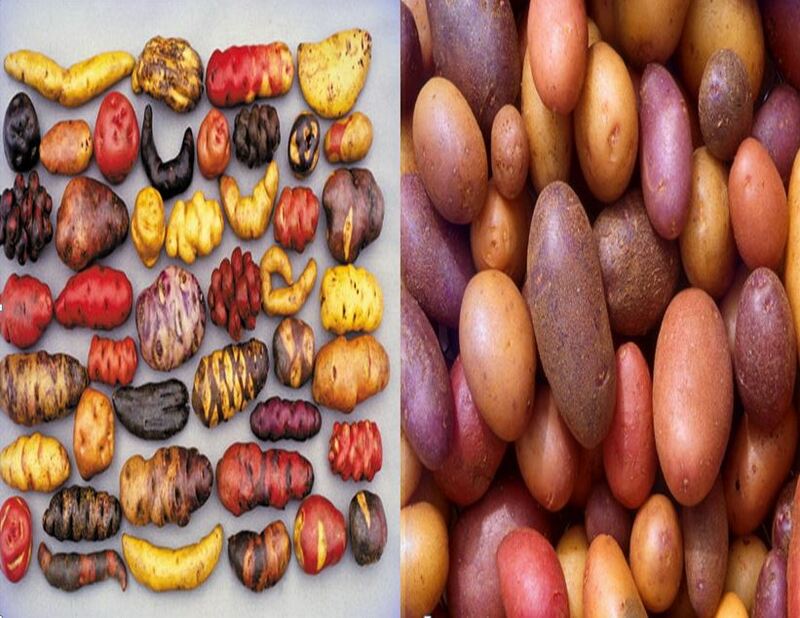 Today most cultivars of potatoes have a white, yellow or red skin, the flesh being a white or pale yellow color, some of the older varieties were blue skinned with blue flesh or red skinned with red flesh, many of these change color to a grey when cooked, but recent plant breeding has developed improved both blue and red potatoes that retain their color after being cooked. These are said to have more anti-oxides than regular potatoes but are grown and used more as a novelty, one use is to use red, white and blue potatoes in potato salad, which of course is more of a novelty that has eye appeal. Potatoes are also classed by their starch content, those classed as mealy or starchy have a starch content of around 22% have less moisture content and often have thicker skins, these are best used for frying because the tend to be less soggy when cooked that way, for baking and for mashed potatoes because they mash easier as well as for potato breads including pancakes due to the higher content of starch. The waxy types have starch content more around 16% and are sweeter tasting have a higher moisture content, a higher moisture content as well as thinner skinned, these types are better suited for boiling and steaming and are the best to use for potato salad. As mentioned already, potatoes have a short shelf life that the staple grain crops at best they last only a few months to a year at most under ideal storage and that only with cultivars that keep well in modern climate controlled storage. Optimum temperature is 45-50 degrees, below that a few degrees and they will convert much of the starch into sugar which alters their taste and cooking texture, above they start to sprout and lose mass, becoming wrinkly and soft. In the past the main storage for potatoes would be in most cases a dug cellar. Depending on the area, the time since the old crop was harvested and the new crop could product “new potatoes” (potatoes from the green, growing vines, large enough to eat but to immature to store) would lead to weeks if not month with out potatoes being shipped in from area with longer growing seasons. Depending on the exact time period, this could be expensive or almost impossible due to the cost and type of transportation used. The 1867 book “THE MARKET ASSISTANT” by THOMAS F. DE VOE mentions the first potatoes the spring are shipped in from Bermuda, in this era of fast sail powered cargo ships and fairly fast for the era, steam ships, it’s only a few days from field to consumer and the boat from the growers region only has to have the potatoes taken to the dock in wagons, and then un-unloaded at the dock and sent by wagon to the market. Someone in say Denver is going to have to pay the cost to load and off load several places during the trip and the much longer journey may be in less than ideal conditions than needed to allow the potatoes to arrive in tip top shape. The introduction of the potato and the equipment to make planting and harvesting also had an impact on the way we eat, many other root crops lost their popularity, ones such as beet, turnips and such, still seen in sores and on tables, they are not used near as much as in the past. Today around half the potatoes grown in the United States are used for fast food French fries and such sank food as potato chips.